As our amazing supporters know, Support Jeffco Kids started a fundraiser with the first 9 yard signs that we have in our hands! Anyone who donates $25 or more by the end of today will be entered in our drawing to be held Thursday morning! In the past 48 hours, you have helped us to raise more than $2000! We are still collecting entries – keep up your amazing hard work and support! Make a donation by clicking the tab at the top of our website! Our next newsletter will go out soon – sign up on the contact tab at the top of our website. Instructions will be provided for the yard signs and bumper stickers that will soon be in our possession! 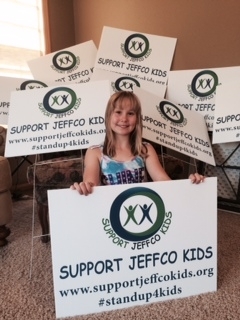 We are very excited to see everyone Support Jeffco Kids! Previous PostFor Students Who Participated in ProtestsNext PostDon’t Mess With Public Comment!